I don’t know about you readers out there, but I have all these weird and ridiculous rules/guidelines/standards I’ve laid out for reading books. How to prioritize reading them, how to shelve them, which ones to save or give away or sell, which ones to buy, which ones to check out from the library, etc. I think some people do this with their music. I’m sure I’m not the only obsessive media purchaser/organizer out there. Raise your hand if you also get Type A joy from organizing your media collections and setting standards for operation on how to maximize pleasure gained from your collections. One thing I do is save books I know I’ll love. I have not read The Book Thief yet because I know that it’s going to be a very satisfying read. So, I’m trying to put off my pleasure as long as possible to maximize it. About a year ago, I read I Am the Messenger. 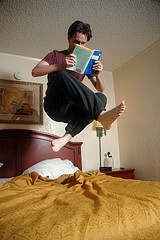 I’d not read any Markus Zusak before, and I was completely enthralled – like the dude in the photo. So then I heard that The Book Thief was better. Friends, reviews, and blogs all agreed on the matter. I added it to my to-read list and have been letting the idea of reading the book flirt with me for a year now. This last week, I took the next step. I ordered the book. I ordered it along with three other books that I very much want to read. In fact, this grouping of books (Prophecy of Days, I Now Pronounce You Someone Else, and Everlasting) along with The Book Thief is the most excited I’ve been in a looooooooong time about reading. I love debuts because they’re like wild cards. Will I like the book? The author? There’s a risk of having bought a book I may have wished I’d checked out instead that makes me a bit giddy (probably I shouldn’t do much gambling in my life). With this grouping of books, I doubt very much I’ll be disappointed AT ALL, and I’m just loving these books sitting on my library shelves and nightstand waiting for me. Now, part of the process is that I must read my wild card books (the unknowns) before The Book Thief (the known) to really build the suspense and maximize pleasure. I’m currently reading the first of the three Young Adult author wild cards. Ooh, it’s so good. Dare I say it’s great foreplay for The Book Thief. Also, I’ve chosen (I think) light books to proceed Markus Zusak’s book, which, to give you a clue (if you don’t know) is narrated by Death. Uh, yeah, I’m gonna cry like my puppy died. And I can’t wait. I’m bazoo. But I don’t care. I’m a happy reader. What’s your media purchasing/organizing/maximizing pleasure process like? Don’t be shy. Tell me your secrets. Add another dilemma for some of us – which books to purchase for kindle (or other e-reader) and which to buy in hard copy. I tend to do kindle for light reading – the kind of stuff that I like to read when waiting at a doctor’s office, when I get 15 minutes in between student conferences, etc. Anything more in depth I find I need a hard copy of. I got my kindle for research purposes as there are a lot of old 19th-century books available on google books that I can’t get in hard copy. I’ve been surprised by how much I enjoy it for other forms of reading. For books, my 1st rule is: if the author is alive, I buy it new. If not, I’m free to library it, buy it used, or get it free online (for public domain works). For most books, I look first for the ebook at Fictionwise (for the rewards program). If it’s not there, I go through BN.com (for eReader app) or Amazon (for Kindle reader app). If it’s not available in e, I might have a gander at the local indie. If they don’t have it, I go to BN to use my membership. The only books I like to keep around are cookbooks. I give everything else away or take it to the theatre I work for, to be part of the staff or camper libraries. Great to hear that someone has self-imposed rules. Enjoy THE BOOK THIEF! It made my Desert Island Reads list. Sweet! You are welcome in my library any time! And WOW to the desert island list. I’m getting more and more excited about this book! First, you don’t know me. I found your site by way of your sister, who is a friend of mine. She’s awesome — but you already know that. Anyway, glad you’re settling in. You are indeed in a fantastic neighborhood, and I only know this because I’m all too acquainted with the cupcake shop of which you speak. Let me just say HOLY MOLY. The coconut cupcakes are amazing. And the strawberry. And the red velvet — how could I forget the red velvet?? See? I little TOO well acquainted. Enjoy the library and the cupcakes! Maybe we’ll cross paths one of these days. Thanks for visiting my blog, Ket! I do indeed have a sister from Awesometown. I’ll bet we do run into one another at the cupcake shop. I haven’t yet tried the coconut or the red velvet because I keep ordering the lemon and lime. I want to branch out, but their so good!